Work on a £300,000 City Council scheme to create a new bus lane at Derriford Hospital which was due to start this month has been postponed. The scheme, part of the Northern Corridor public transport improvements, was due to start on the 16th November, but there have been concerns as to how the necessary traffic diversions would effect the running of such a large acute Trust. In order to assess whether the Trust can function with the necessary traffic diversions and management proposals, it has been agreed to trial these diversions in full on the 1st, 2nd and 3rd December 2009. The data gathered over these three days will be invaluable in ensuring that the traffic management plans actually put in place when the bus lane works commence in full, are the least likely to cause major disruption to the hospital and cause any delay to emergency vehicles. The road from the main entrance to Derriford Road mini roundabout (past the entrance to the old Hospital Residences) will become exit only i.e. NO traffic will be allowed to enter the site at the mini roundabout. The Council will have diversion signs in place. Entry to the hospital will only be via either the car park B/Emergency Department side of the site (off Derriford Road) or through Morlaix Drive (off Brest Road). Morlaix Drive will be controlled by traffic lights at all times. Nursery users and visitors to Kingstor House and the Rowans Building will not be able to access these areas via the Derriford mini roundabout but will have to follow the diversions in place. This will add time to these journeys especially during peak times. There will be on and off peak traffic lights in place at both hospital junctions along Derriford Road. 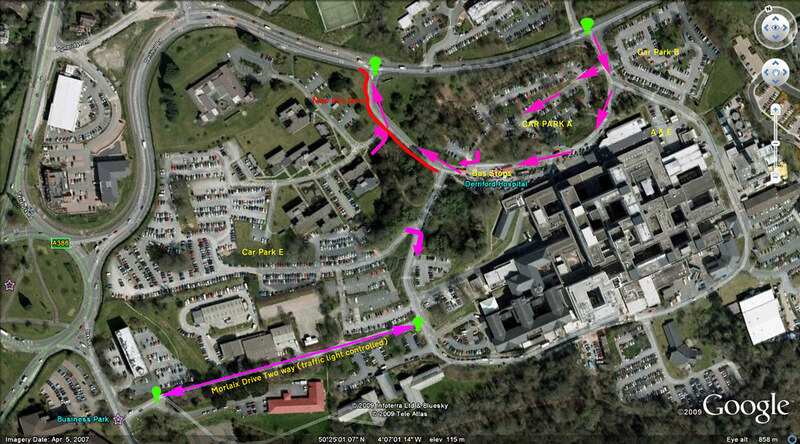 All staff exiting from staff car park E must turn right and exit the hospital via Morlaix Drive. Bus inspectors will be in place to ensure buses do not double park and block the road outside the main entrance. A parking attendant will be on duty between 08:00 and 18.30 outside the main entrance to keep traffic moving and prevent cars, delivery vehicles and vehicles from causing a blockage in this area. Once complete, the new bus lane will improve journey time and reliability for people using buses to the hospital as well as provide better pedestrian access. The Trust is absolutely committed to improving sustainable travel and journey times by bus and is looking forward to the completion of the new bus lane as soon as practically possible. I have produced this quick and dirty map to show the basic idea. I really hope that this does work as it is crucial to get the new bus lane in as soon as possible. It is good that they are being cautious and trialling this traffic management scheme before they go ahead with the full works. I can see a few issues which are likely to cause problems to begin with. I do like the line "Bus inspectors will be in place to ensure buses do not double park and block the road outside the main entrance" I am really not sure exactly how they are going to do this as there quite simply isnt the room for all the buses to stop at peak times. If all the bus stops are full are they just going to send a bus round again until there is space for it to stop? The other crucial part is going to be the timing of the traffic lights. If they get that wrong it will be chaos! I have always believed that a one way system would help, so it will be interesting to see if I am right. Once people get used to it I think it will help but I am sure the first day at least will be difficult. The other area I can see problems is Morlaix Drive which is very narrow but will remain two way traffic. The traffic lights there may just make things worse if they back traffic up too much. At least most of the traffic will be entering in the morning and leaving in the evening so it should be possible to get the lights set up correctly.It will also see more traffic trying to get out onto Derriford Roundabout from Brest Road. This is difficult at the best of times as often only one or two cars can get out at a time as it is. I am sure that it will be difficult for a few days but I do think it will be worth it if they can keep traffic moving enough to consider staring the new bus lane. It is certainly going to be fun on Monday! Sorry to ask, but can you tell me on the map where this new bus lane will be? All sounds well and good in principle, but the Morlaix Drive bit will cause problems for the ambulance service getting out - already bad enough as it is beign a free for all, but saying that if there are going to be traffic lights controlling each direction there may be a bit more organisation to the usual chaos! I have just replaced the map - and added the bus lane - in red. It runs almost from the bus stop area up to the bus lane on Derriford Road.